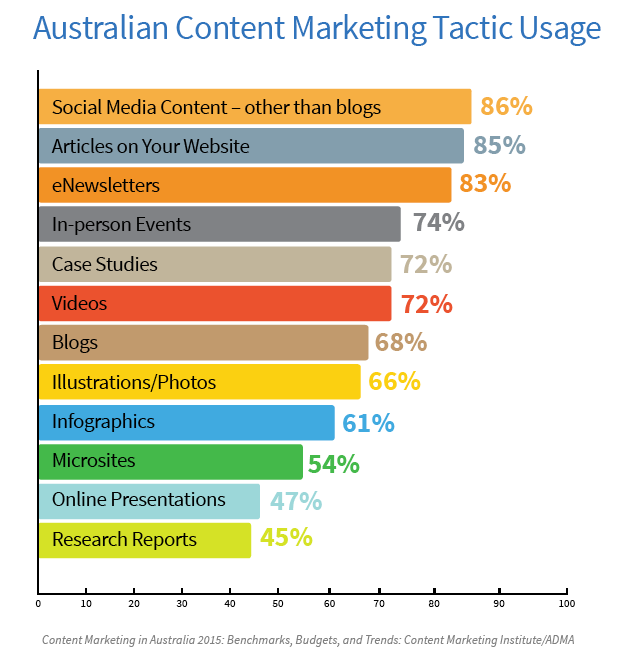 The 3rd annual Content Marketing in Australia: 2015 Benchmarks, Budgets, and Trends report was released today showing Australian content marketing is becoming a full-blown discipline. What’s also apparent is we’re in a creative phase of experimentation, embracing strategy but floundering on execution. Nearly 90% of respondents to the Content Marketing Institute’s survey said they’re using content marketing. More than 80% said they have a content marketing strategy, even though 46% said it isn’t documented. It’s incredibly encouraging to know we’re past the dip-a-toe-in-the-water approach with content marketing in Australia. “The initiatives they’re working on demonstrate that Australian marketers are focused on better understanding their audiences so that they can provide valuable content. “They’re also experimenting with how they use specific tactics to reach those audiences. 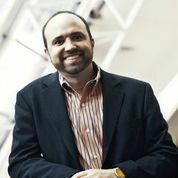 “In particular, we saw a decrease in blog usage this year and increases with infographics, in-person events, and microsites,” Pulizzi explains. What didn’t surprise me is the positive impact of a documented strategy. Having one ensures consistency in your marketing. Following the strategy is the only way you can measure effectiveness. If you’re not going to measure, you can never be sure of whether your marketing is working or worth the investment. “There are two critical factors that differentiate effective content marketers over the rest of the pack – having a documented content marketing strategy and following it very closely. Those two things make all the difference,” says Pulizzi. 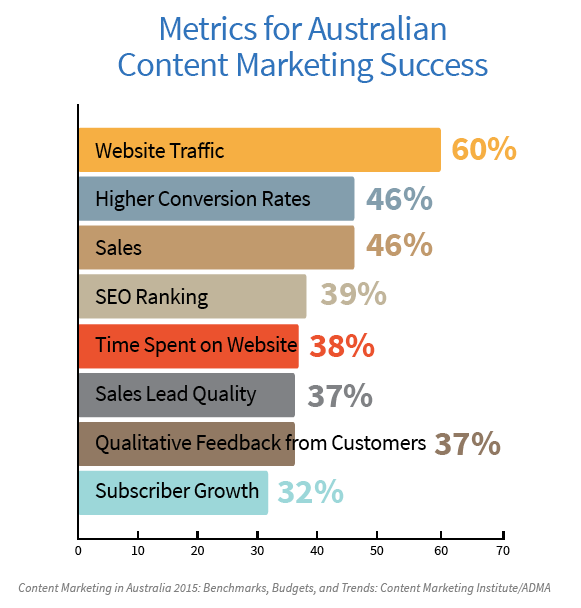 While we’re discussing metrics, it’s interesting to note how content marketers in Australia are measuring success. Website traffic topped the list, but I would argue that’s not the most effective measurement. I’m a firm believer all marketing should be based on some sort of conversion. Higher conversion rates and sales (the mother lode of all conversions) tied for second place. Even then, not even half the marketers surveyed listed either one. 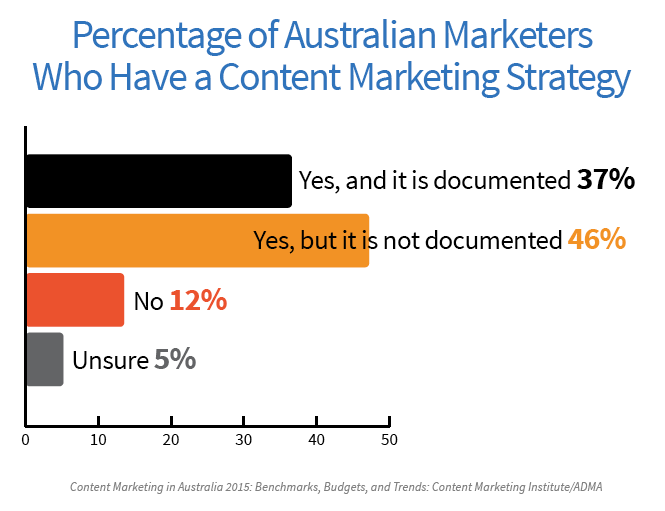 I’m encouraged by the results of this survey that also shows Australian marketers plan to increase their content marketing budget over the next year. We enjoy a nimble approach to marketing in Australia with two-thirds of the workforce employed in small businesses. We may not have mega-budgets for marketing but we often have greater autonomy than our North American and European counterparts. This breeds an environment of creativity, which is great for marketing and even better for the consumer. If you want to know more about content marketing and how to achieve better results, make sure to attend Content Marketing World Sydney this year. It’s absolutely the best conference around and the amount of information shared is phenomenal. I promise you’ll come back with more ideas than you know what to do with and a clear understanding of how to improve your day-to-day activities. Lastly, if you’re serious about creating a content marketing strategy for your organisation, get in touch. I’m happy to help you explore how you can improve the effectiveness of your content marketing efforts.